Unfortunately no new content was published here last year. Nevertheless, this blog received lots of visitors. Looking at last year's statistics about the most viewed posts and pages, I find three clear winners. This post from 2006 is about the book Plausible Prejudice by Marianne Gullestad.To understand the problems of the world today, we need to "decolonize anthropological knowledge", she writes. This is also the most commented post on antropologi.info. It is about Sierra Leonean-American anthropologist Fuambai Ahmadu who attacks Western feminists, media and anti-Female Genital Mutilation campaigns and accuses them for presenting a one-sided, ethnocentric picture of female circumcision. This pages provides an overview over the recent blog posts by anthropologists in English, German, and Scandinavian languages around the world. A post about a book by Talal Asad where he asks questions as: What actually is terrorism? What kind violence is labelled as “legitimate” and why? Is there really a big difference between soldiers at war and suicide bombers? A post about an article by Brian McKenna in Counterpunch where he writes: "We need courses and programs in “Anthropology & Journalism” to help create the critical public intellectuals of the 21st century." A post about Uy Ngoc Bui's master’s thesis about the role of NGOs, the state and the people themselves’ in the period after typhoon Durian hit Bến Tre province in Southern Vietnam. A post about an article in USA Today about negative consequences of Christian missionaries on an island who try to convince the islanders that it is men, not women, who should make the first move and propose. A post after the death of a close friend. Suicide is best approached by getting out of the confines of biomedical sciences and into the domains of anthropology and sociology. A suicide is not primarily a sign of “that there was something wrong with a person", but also that something might be wrong with society as a whole. A post about the book Reversed Gaze by Kenyan anthropologist Mwenda Ntarangwi who conducted an anthropological study of American anthropology. Whereas Western anthropologists often study non-Western cultures, he studies “the Western culture of anthropology". A post about Shahram Khosravi's journey from Iran to Europe as “illegal” refugee whose life was saved by a human smuggler. A post about Siham Ouazzif's thesis “Veiled Muslim Women in Australian Public Space. A post about an article by Lila Abu-Lughod who critizes the images of Muslim women that are constructed in the "West" especially after 9/11. After 12 years it was time to update the layout of antropologi.info. I tried to keep some of the old elements while adjusting the look to our new times. The design still needs some tweaking, I will work on it during the holidays. If you encounter any errors, let me know! Maybe one or two new posts might show up as well, one never knows. Since my last post in April this year, I was finally able to leave Egypt with my wife and move to Germany where I found a job as German teacher. This is a quite demanding job, so I will have to reserve a few hours during the weekends for blogging! Anyway, this was just a short post to say hi, this blog is still alive! Enjoy the holidays if you have some, and all the best for the next year. See you soon! Today I have finally upgraded the antropologi.info's blogging software (b2evolution, not Wordpress!) and made its templates mobile friendly. So, now, finally, antropologi.info no longer looks so weird when you visit it with your mobile phone. In my tests it looks ok now, let me know if it works for you. The upgrade isn't finished yet, there are still some things that have to be put in place, like search and new cover images. And here and there, things might not work as expected. On some pages, the sidebar does not show up for some strage reason. I'll fix these things tomorrow, I hope. Feel free to report any issues you might face. Thanks! (draft, post in progress) More surveillance, more bombs, more border controls, less democracy, less freedom: Europe is reacting hysterically after the deadly terror attacks in Paris one week ago. How to make sense of what is happening? The deadly terror attack in France has brought, as anthropologist Jeremy Trombley at Struggle forever writes, "the violence that people around the world experience on a daily basis back into our own sheltered and secured lives. They remind us not only that the world is a violent place, but that, perhaps, our lives are peaceful because there is violence elsewhere." People in Europe have during the recent days got the chance to get an inside view into the struggles of people in less priviledged countries that are regularily bombed by the West. In theory there is a slight possibility for some kind of solidarity or cosmpolitanism to develop out of this, and a critique of Western policies. The common discourse in mainstream media is - unsurprisingly - a totally different one. Sadly, l'horreur of Paris 13 Nov. 2015 will, probably, lead to greater political support for the hawks: the anti-Muslim, anti-immigrant, anti-refugee, pro-militaristic, pro-fascist and neo-Nazi elements in France and other parts of the EU. We will hear that it is necessary to relinquish freedoms in order to protect liberté, and solidarité will be purchased with rhetorics of anti-immigration and victim-blaming. This natio-chauvinist "we" against "them" rethoric tends to silence cautious attempts to discuss the wider context of the terrorist attack, including the role of the West in creating terrorism, and the possibility that the operations by Western powers can be viewed as terrorism as well. "Them", in the official discourse, not only refers to the Daesh/ISIS attackers but increasingly to all muslims and "non-western" refugees (like those who are escaping the madness i Syria) and immigrants and those who speak Arabic. Several anthropologists, in their immmidiate reactions to the terror attack, insisted to focus on the wider global context of the terror attacks where the Western powers do bear some responsibilities. The fact is that the French killed 1 mn people in the Algerian war of independence, the second genocide they got away with (the other being Vichy). They have now made themselves the US' closest ally in bombing North Africa and the Middle East, invading Mali, Central African Republic etc. In radio discussions here no-one ever questions their right to do this. [T]he value of human lives varies depending on where you live and who you are. This may be stating the obvious, but there is rarely if ever a major outrage in the rich countries when a drone attack or a missile targeting a terrorist leader instead ends up killing dozens of innocents, including children. Yet this happens routinely and frequently. Not everybody agrees that it is acceptable that the rich countries murder civilians in poor countries, and the Paris terrorist attack can thus be understood as an act of retribution. Viewed from an subversive anthropological perspective, the distinction between good and bad guys, between terrorists and victims is not as clear as mainstream politicians suggest. Maybe the term terrorist is not a very helpful one at all. Maybe we can get a better understanding of IS/Daesh when we call them - as anthropologist and terror researcher Scott Atram does - for revolutionaries. In the Guardian he writes that treating Isis as a form of "terrorism" or "violent extremism" would mask the menace. Instead, he describes Isis as being part of a "dynamic, revolutionary countercultural movement of world historic proportions, with the largest and most diverse volunteer fighting force since the second world war". In a fascinating interview om Russia Today, he explains the revolutionary aspects and even draws lines back to Hitler. No, it appeals to people in span of normal distribution. I mean, it's like any revolutionary movement, that's why I think even calling it terrorism or just extremism is beyond the pale. (..) It's very much like the French revolution, or even the Bolshevik revolution or even the National Socialist revolution... I mean, look at the French revolution, they were eating one another just like Al-Nusra and ISIS and other groups are eating one another like bloodied sharks, and they were invaded by a coalition of the Great Powers, and yet not only they survived, but they endured, and they introduced the notion of terror itself, as an "extreme measure" as they called it, "for the preservation of democracy", and every revolution since then, every real revolution has done pretty much the same thing, pretty much successfully, so ISIS is no exception. (...) In any kind of truly revolutionary movement there's a feeling of invincibility once you've fused with your comrades in your cause. The idea is their history is on their side. So, even if they take battlefield losses, they're not going to consider that a loss at all. Look, George Orwell in his review of Adolf Hitler's "Mein Kampf" back in 1939 have described the essence of the problem. He said: "Mr. Hitler has discovered that human beings don't only want peace and security and comfort and free from want. They want adventure, glory and self-sacrifice, and Mr. Hitler's appealed to that - and while the Oxford student union at that time vowed to never fight again, Mr. Hitler has 80 million people fall down to his feet, in one of the most advanced countries in the world." How did that happen? Again, ISIS is appealing to the same sort of sentiments, that have been appealed to throughout human history... and no, I don't think we've learned much from history about that. ISIS consists of young poeple, people in transition. ISIS, the interviewer suggests, might be seen as a form of teen rebellion then? The anthropologist agrees. It is - as most revolutionary movements, driven by young - and educated people, he says. But, the interviewer wonders, we're used to think that young people want freedom, but ISIS is forbidding this? I got a call from head of Medical School telling me that her best students have just left to set up field hospital for ISIS in Syria, and she was asking me why would they do this; and I said, "because it's a glorious and adventurous mission, where they are creating a Brand New World, and they do it under constraints." I mean, people want to be creative under constraints. A lot of young people just don't want the kind of absolute freedom you're talking about. The choices are too great, there's too much ambiguity and ambivalence. There are too many degrees of freedom and so one can't chart a life path that's at all meaningful, and so these young people are in search of significance, and ISIS is trying to show them a way towards significance. Again, we have to take it very seriously, that's why I think it's the most dynamic counter-cultural movement since WWII, and it's something I don't think people are taking seriously, just dismissing them as psychopaths and criminals and... this, of course, is something that we have to destroy. I think, we're on the wrong path in terms of the way we're going to destroy it. So what is they way out of this? The first step is in Atran's view to understand this movement. Current counter-radicalisation approaches lack in his view the mainly positive, empowering appeal and sweep of Isis's story of the world, and the personalised and intimate approach to individuals across the world. What inspires the ISIS-fighters is not so much the Qur'an but "a thrilling cause that promises glory and esteem". It's because human subjects reviews at universities and especially the [US] defence department won't let this work be done. It's not because it puts the researcher in danger, but because human subjects [research ethics] criteria have been set up to defend middle class university students. What are you going do with these kind of protocols when you talk to jihadis? Get them to sign it saying, "I appreciate that the Defense Department has funded this work," and by the way if you have any complaints, call the human subjects secretary? This sounds ridiculous and nothing gets done, literally. Then you have crazy things [required by US funding bodies] like host country authorization. Suppose you want to do work in Israel and Palestine. So you go to the Israelis, say, "We want to do studies, just like we do in American universities" and say, "We need host country authorization from some government." They say, "Are you crazy?" And in many countries that are in chaos, who's going to give you permission? It seems to me that there is no moral difference between the horror inflicted by state armies (especially if those armies belong to powerful states that are unaccountable to international law) and the horror inflicted by its insurgents. In the case of powerful states, the cruelty is not random but part of an attempt to discipline unruly populations. Today, cruelty is an indispensable technique for maintaining a particular kind of international order, an order in which the lives of some peoples are less valuable than the lives of others and therefore their deaths less disturbing. Terror in Oslo: Who cares about Christian right wing extremism? Mahmood Mamdani: "Western concern for Darfur = Neocolonialism"
How can anthropology help us understand Swat and Taliban? Anthropologists: "It's time to kill the Osama bin Laden myths"
It does not happen often that there a good news from Egypt where I am still living. This news here, although nearly too good to be true, is at least interesting. In January, Egypt is going to launch the Egyptian Knowledge Bank. Anybody with an Egyptian IP-address will be able to get free access to academic journals, ebooks and other publications that normally only would be available to a small circle of individuals that are affiliated with well-funded universities. Agreements with 26 international publishing houses have already been signed. According to an official statement by the president's media office the Egyptian Knowledge Bank project would be "the largest digital library in the world". "Our goal is to provide all Egyptians with access to world-class publications, like Nature and Encyclopedia Britannica. By providing these materials free of charge, the knowledge bank ensures that all Egyptians, no matter what their economic circumstances, will have the tools they need to excel in their education and research", Tarek Shawki, chair of the Presidential Specialized Council for Education and Scientific Research, says. Gaining access to research materials from private journals and other for-profit online publications has long been difficult in Egyptian academic circles, according to the news site Mada Masr. While the American University in Cairo is able to pay for online journals and databases, public universities like the University of Cairo aren't able to do the same. The agreement with publisher Elsevier, for example, "provides access to ScienceDirect, Elsevier's full-text platform for research literature and abstract and citation database Scopus. They also include Elsevier's clinical search engine ClinicalKey, and engineering reference platforms Knoveland Engineering Village. The partnership also gives Egypt's policymakers access to SciVal, meaning they will be able assess the impact of these tools, and make informed decisions on how and where to invest in research", according Elsevier. This state-funded initiative is an interesting variation of the open access debate. So far, the efforts have been focused on making the journals itself free to access - a nearly impossible task so far, at least regarding the more prestigious journals. The growth in open access journals, at least within anthropology - is, it seems, rather caused by the establishment of new journals like HAU, Altérités or Vibrant than established ones becoming open for anybody. 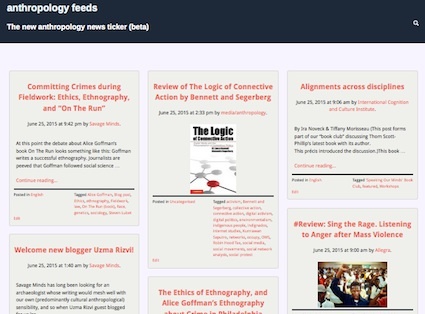 Would you like to get an overview over the most recent anthropology blog posts? The old newsticker did no longer work reliably, so I've created a new one. It is still work in progress, but so far it seems to work well. I tried to make it look more attractive, with a newspaper look, images and short excerpts with responsive design that also looks good on mobile devices. It also provides a tagcloud from all the categories that the blog authors assigned to their posts, a probably useful tool for exploring previous posts. So far, 100 70 blogs are included, so far only English and German ones. I might add more languages later. Please let me know if there are other blogs that I should add or if things are not working as expected, either here in the comment field or via the contact page. As mentioned, I'm still working on it, there is a lot more that can be done with the current set up. It was not easy to find a good solution. I was about to go for a commercial solution but then I was so happy to find the free and opensource feed aggregator FeedWordPress by "web developer, student of Philosophy, and sometime political activist" Charles Johnson. The more I more I've used the more fascinated I became by this plugin. I am also very thankful for the smart template Ocomedrev that web developer Antonio Sánchez created. I only modified it slightly. While I am trying to get back into the blogging business, here three selected pieces that I've written recently for the University of Oslo. Two of them are accounts on somehow positive change that is happening. Many anthropologists have contributed to the understanding of the economic crisis in many parts of the world during the recent years, see among others the earlier posts "Use Anthropology to Build A Human Economy" or "Similar to the Third World debt crisis" - David Graeber on 'Occupy Wall Street'. But few studies deal with the ways people tried to create alternatives to the currently dominating economic models. I found it therefore particularily interesting to talk to Theodoros Rakopoulos who is currently studying the thriving solidarity economy in Greece: an economy based on mutual aid, cooperation, bartering and collective welfare. Time banks, volunteer-run health clinics and pharmacies, alternative currencies, food distribution without middlemen: People “mostly from humble economic backgrounds” are experimenting successfully with alternatives to austerity policies that have been dictated by the EU Commission, the European Central Bank and the International Monetary Fund. Theodoros Rakopoulos has been on fieldwork among the anti-middlemen movement, one of the most successful solidarity economy initiatives that popped up in Greece since 2010. Strangely enough, I haven't heard about these developments before. I suppose it's because media was more interested in reporting about the rising xenophobia in Greece. But the researcher explains that the new solidarity economy has "arguably a wider impact on peoples’ daily life than the much talked about rise in far-right parties like Golden Dawn”. Anthropologist Knut Christian Myhre is currently writing a book about unusual bureaucrats. Instead of reviewing laws and policies in their offices, they tour the country, hold public meetings and communicate with citizens via social media. This initiative, Myhre thinks, can serve as example for other countries wishing to revive local democracy and expand their political and legal repertoire. His main focus was the so-called Shivji Commission that in 1991 was appointed by President Ali Hassam Mwinyi to inquire into the state of land conflicts in Tanzania. For one year this commission toured around the country, held 277 public meetings in 145 villages and 132 urban centres in all of mainland Tanzania’s 20 administrative regions. Around 83,000 members of the public took part in the process. Local researchers and experts prepared six major studies, while the commission made visits to Kenya, Zimbabwe, Botswana, and South Korea to learn from their experiences. >> read the interview with Knut Christian Myhre: "A model also for other countries"
We are living in times characterized by increasing mobility and transnational connections — or so it seems, at least, for some people in the richer parts of the world. Anthropologist Heike Drotbohm has been on fieldwork among people for whom the opposite is true. "When Jacky was deported from the USA to Cape Verde, his life came to a sudden standstill. Within a short time his face grew deep wrinkles; it looked resigned, exhausted, and drained. Merely at his age of 45, Jacky looked like an old man. Anthropologist Heike Drotbohm is looking at a recent picture of Jacky and is puzzled. She met him six years ago and now she can hardly recognize him. While peering at more pictures of deported migrants she met between 2006 and 2008 on Cape Verde during her fieldwork, she is compelled to make the same conclusion. All of these people seemed to have aged disproportionally fast. Their faces, it seems, tell us uncomfortable stories about the transition from a mobile and independent life to the forced immobility on Cape Verde: an arrow-shaped archipelago in the Atlantic Ocean that the men left many years ago." Now, I'd like to mention especially two blogs. The first one is Thomas Hylland Eriksen's blog at http://thomashyllanderiksen.net He is one of the most visible anthropologists in the public, he set up his first website already back in prehistoric 1996 (recently rebuilt and moved to http://hyllanderiksen.net). So finally, we will get more frequent updates about his work and thoughts on his blog. Some of the recent posts include Fossil addiction: Is there a road to recovery?, Whatever happened to prog? and About Progress, where he dares to criticize the ruling rightwing-populist Progress Party in Norway. Within few hours his post stirred up a bit of controversy in the media. The other new blog is by Sindre Bangstad at http://www.sindrebangstad.com/ I am glad he finally set up his first website. I've been following him on facebook for a while where I enjoyed his daily comments about the state of the world and the numerous interesting links he posted. His main focus is islamophobia and racism.